As with any kid in high school in the late sixties I listened to rock by The Beatles, The Rolling Stones, and so on, but I also listened to R&B: Diana Ross and the Supremes, The Temptations, Stevie Wonder, Smokey Robinson, Aretha Franklin, Al Green, Wilson Pickett, James Brown, Otis Redding, and a whole pile of other things I’m forgetting right now. I saw Sly and the Family Stone twice at the Montreal Forum. As R&B dwindled into disco I gave it up for dead. I was vaguely aware of Michael Jackson and the moonwalk, but it was Prince who grabbed me by the throat, slapped my face, and said pay attention. His song-writing ranged across soul, R&B, funk, and rock, and he was prolific, producing close to an album a year for the rest of his life, which, of course, ended just over a month ago, from a fentanyl overdose, probably prescribed originally for a hip problem, that resulted from too much leaping and dancing in the high heels or platform boots. Michael Jackson was the better dancer, but Prince’s dancing was crazy and thrilling. He would jump from five-foot risers or dance on the soundboard of a grand piano, then leap to the stage. He could do the splits and rise slowly by squeezing his legs together. Prince in his early career was either a man with a vision, or a control freak, depending on your point of view. He plays all twenty-seven instruments on his first album, For You, which remains one of my favorites. He brought together a performing band, The Time, got them a record contract, then wrote or co-wrote all the songs and went into the studio and played all the music. Morris Day would come to lay over the vocals at the end of the recording; at one point Day says, “take it, Terry” (Terry Lewis, bassist for The Time), which is followed by a scintillating Prince bass line. 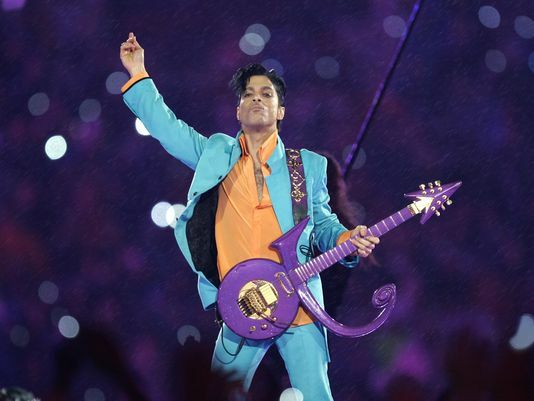 Prince had an extraordinary range of musical taste, covering in his concerts everything from Radiohead to Sheryl Crow. One of his absolute favorites was Joni Mitchell, and from his earliest concerts to his most recent he would throw in a cover of “A Case of You.” YouTube can turn up a variety of sensational Prince guitar solos. My favorite comes from the Hall of Fame induction of George Harrison. Harrison had recently died and his friends Tom Petty, Jeff Lynne, and Stevie Winwood arranged a tribute performance of “While My Guitar Gently Weeps.” As the song is winding down Prince concludes with a two-minute guitar solo. All Prince fans have a list of their favorite albums. Here’s my somewhat lengthy list: For You, Prince, Controversy, 1999, Purple Rain, Parade, Sign o’ the Times, Lovesexy, Batman (the soundtrack), Graffiti Bridge, the “Love Symbol Album” (with the glyph standing for the artist formerly known as Prince), and Rave Un2 the Joy Fantastic.